I have watched the movie City of Ember years ago, back when it came out and thought the story of it was great, I found a copy in a secondhand bookstore in Barcelona last year. The book is a little (much) less amazing as the movie. 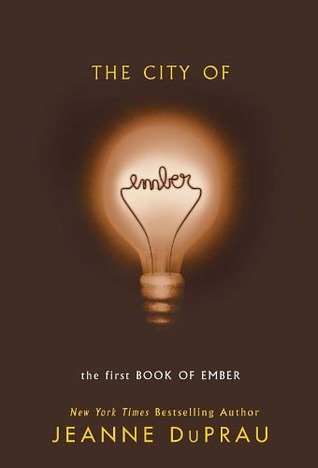 The story of The City of Ember is something new and the travel to get out of Ember is interesting. But I thought it wasn’t something very special and the main character of Doon was one dimensional. Where Lina cares for her little sister and her grandmother, Doon falls flat because all he cares for is wanting to fix Ember. The story is like a river, it just starts out slow, then has a couple of fast patches and then ending in this calm and boring part again. Overall the writing is great, you get a good impression of Ember and even though the city is dark and amber, the writing makes it seem colourful. I hated the end because it felt like there was supposed to be more, but it didn’t. In 2008 City of Ember was released with Saoirse Ronan and Harry Treadaway as the main characters Lina and Doon. I thought the movie was more spectacular than the book. It was funny and had Bill Murray as the big fat mayor. The movie is great and a good teen movie. This entry was posted in Book Review and tagged Adventure, Book Review, Dystopia, Fantasy, Jeanne DuPrau, Mystery. Bookmark the permalink.